Need a beautiful and sturdy dinner set? Here at Latest Deals, we will provide you with the best bargains available online and in-store. Get a quality dinner set at reputable UK retailers such as Argos, Very, ASDA, Studio, Wilko, and more. These cheap dinner sets come complete with plates, cups, saucers, spoons, and forks. 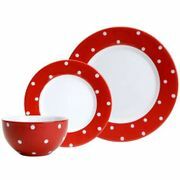 Take advantage of the latest dinnerware set UK voucher codes and get as much as 40% discount on selected dinner sets. You can also have your orders delivered to the comfort of your home for Free with the right voucher code. Argos Home Everyday Luxe 12 Piece Dinner Set - Dark - More Than HALF PRICE! Get massive savings on quality dinner sets with the latest discounts and voucher codes from UK retailers! A complete and functional dinner set has the ability to light up most family gatherings or social events. Starting with the finest plates, down to the sparking cutlery and utensils that you can own, your entire family and guests are definitely up to enjoying their meals. As you shop through the kitchenware department of most shops be it traditional or online - you will realise that most prices vary from one to another. Do not be discouraged though because there are always affordable sets that are bound to meet your needs. From the fanciest restaurants to the simplest suburban residents, dazzling dinner sets are typically utilised daily. There are those which are imported from other countries like China; there are others on the other hand which are practical. Hence, they are intended to be used everyday. If you are thinking of displaying them, this should work too. If you opt to only have your sets on holidays or special events, any of these may also be ideal. Just remember that as you purchase, the additions should be saucers, plates, knives, spoons and forks. Do not get this wrong though because there are items which feature centerpieces and serving bowls. Whether you are starting collecting dinner sets, or you want to upgrade what you have - you are headed towards the right direction. Today, you can shop around and make the most of many options without hurting your budget. There is a wide array of options waiting for you. Where Can I Find Cheap Dinner Set Online? From the basic dinnerware to the most sophisticated set, you will be able to find whatever works on your taste without spending so much from your favourite UK retailers. The possible savings you can get from your shopping comes from the discount codes, voucher codes, special offers, sales, freebies an price drops verified and posted by our community of bargain hunters. Be a member and get access to quality dinner sets from IKEA, Argos, and others. Our team of money-saving experts online update and share the best deals on square dinner sets and dinner plate sets. Browse them and find an offer that suits your budget. Most of these offers are from your most credible retailers including ASDA, Debenhams, eBay, Habitat, and many more. Argos. 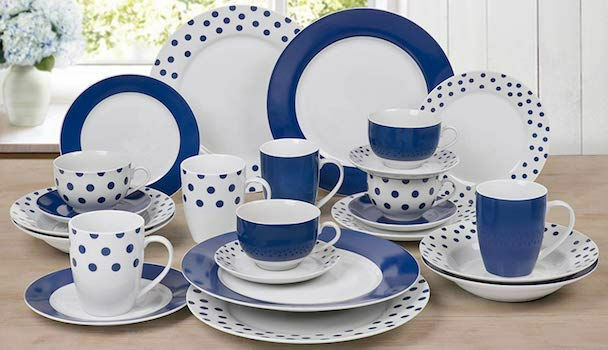 If you are looking for porcelain dinner sets, stoneware dinner sets and ceramic dinner sets - you should start visiting Argos because it has a massive range you can choose from. Buy any of those without burning a hole in your pocket for this retailer reduced the prices of its dinner set offerings into half. Make the most of this deal while it is still available. Debenhams. 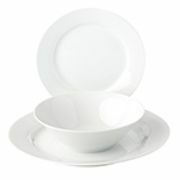 Go to Debenhams and take advantage of its dinner set collections. Choose from various brands like Denby, RJR.John Rocha, Ben de Lisi Home, Royal Doulton, Belleek Living, Aynsley China and Mason Cash. You can buy any of these and save as much as 70% off on select designs. GoGroopie. 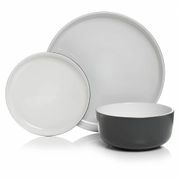 Pick from dinner set with four designs or Avante dinner sets and get a savings of as much as 75% off from your purchase. Visit their online shop and check its offer on other products like home accessories, furniture, garden, clothing and fashion, shoes and bags, jewellery & watches. Studio. From vintage dinner set, 70-piece combination set, black and white lined set, porcelain dinner set, stoneware dinner set, white square dinner set, to gold and metallic dinner set, Studio is waiting for you. Get these and save at least £50 from your purchase. Wilko. Browse through Wilko and own a functional dinner set for as low as £7. Do your shopping and select what you want by type, brand, colour, size and price. Use their filter options to find the best set that fits your budget. Visit these retailers and watch out for deals on embossed dinner set, crockery and tableware. Daily Use. Please understand that dinnerware may also have cracks, chips and fractures. If you do not want these, and then damage resistance should be your priority. Hence, porcelain has always been the hardest ceramic. On the other hand, bone China is known to be the strongest. Semi Porcelain, stoneware, creamware, ironstone and majolica are also runners-up. Now, if you intend to pursue colourful dinner sets, that should be fine as well. But then, it would help if you stick to two colours only because they are easier to complement. What is better about them is that they are also affordable. The Pattern. To get more inspiration about the patterns of the dinner set you can pursue, it is not a bad idea to review various home decour magazines and personally visit furniture shops as well. Even antique shops may also give you bright ideas. Some may opt to go for traditional patterns because such may allow them to buy informal to seasonal, elegant or daily used dinner sets. Romantic - patterns which embody living things including flowers, birds, shells, and fruits. Classic - patterns which are inspired by historical periods including neoclassic straight lines or rococo curving asymmetry. Modern - patterns which are abstract and usually manifest geometric motifs. The Shape. Plates can be classified into coupe or rim shapes. With this, you have to make the right decision so that you can end up with the best dinner set shape that is going to look well in your table setting. This may be challenging but possible. Rim - Typically created with a well to collect the juices which may flow from the food. Coupe - Usually bound for sets without rims. They are also for bite-sized pieces in the kitchen. The Quality. Craftsmanship, balance and proportion - these are all the criteria for quality dinnerware. In here, the plates should lie flat on the table. Aside from this, the rims must not be warped. As for the handles, if there are any, they should be comfortable to grip. The cups, on the other hand, must be secured. These are the ones you need to meticulously look at. If it is not attainable, maybe you can read reviews first from the web before buying sets for you. The Starter. You are most likely to find a starter jet which is made of salad plates, dinner plates, cups, saucers, and soup-cereal bowls. There are instances when starter sets also have bread-and-butter plates, having them would still depend on your preference. If you only have a simple dining requirement, which is for students or newly-wed couples, you can think about beginning with this starter set for you. The Serveware. A serveware is found with eight to twelve place dinnerware settings. A serveware has platters, vegetable bowls, covered sugar and creamer bowls. There are other sets though that have coffee pot, & salt and pepper shakers. The Completer Set. Most often than not, five pieces of matching serveware are available to be purchased which are not included in the starter set. 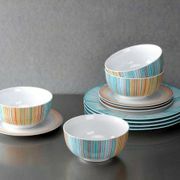 This is a dinnerware called the completer set. There are times when the contents of it may differ though. Some may go with a gravy boat and a butter dish. These are the important factors you have to review when buying a dinner set. Consider them before finalising your purchase.